Home > Women and Children > How will a migraine diary help? 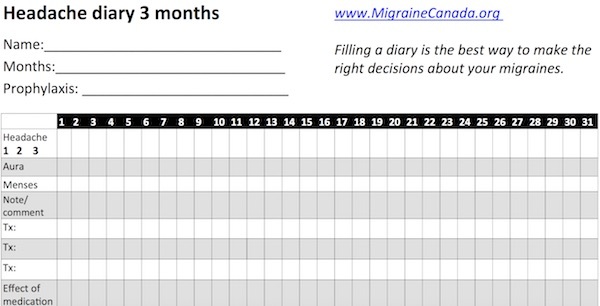 How will a migraine diary help? It is important to keep a detailed headache diary each day that the headaches occur. It is not easy to recall what happened 3 to 4 months ago and diaries make it easier for your doctor to see at a glance how you are doing. There is no blood test to monitor migraine, only a well-kept diary can reveal what’s going on and the more complicated your situation is, the more you need to fill a diary. Bring your headache diary to each appointment with your doctor. By tracking your headaches with a diary, you and your doctor can work together to find what works best for you and try to record all your headaches, mild and severe – so your doctor has the real picture. Sufferers often only write down the bad attacks. And finally – a simple diary that has been filled-in is much better than a complex incomplete one.